Laidback leisure on land, or isolated idling on a private island? Book us for a bit of both at this lush and relaxing resort. Now, this is getting away from it all. One tiny 1-acre island miles from the coast, four comfortable thatched-roof cabanas on stilts with their steps descending literally into the aquamarine Caribbean, and nothing to do except sun, swim, kayak, snorkel or dive the fabulous reef nearby, and laze in a hammock with a book. Pure, unadulterated relaxation complete with hot and cold running water, plus tempting meals served up in the waterfront dining pavilion. Sigh. The solitude of its two private islands (the other, with three rustic cabanas, is even closer to the reef) is, in fact, the extreme at the Inn at Robert's Grove. Most guests settle into the resort's hacienda-style buildings clustered on the Placencia Peninsula right on the Belize mainland, happy with a bit more company and a broader menu of amusements. 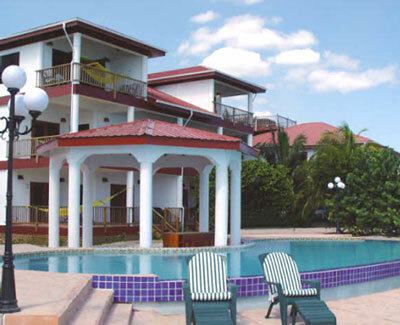 The Inn seems to have that peculiarly Belizean combination of laidback atmosphere, lush au naturel setting, and luscious amenities down perfectly. All the expected perks are there in the rooms and various sizes of suites, from cable TV to ceiling fans to breezy balconies, but what you'll remember is the welcoming feel of the cool Mexican tile floors, colorful woven fabrics, and hardwood furnishings. The resort makes the most of its waterfront setting with a marina, dive center, and water sports galore, but there's a host of inland diversions as well, from bird-watching and nature hikes through the rainforest (check out the jaguars at Cockscomb!) to horseback-riding and caving. Fair warning: You'll want to do everything, but under the soothing influence of sun, salt air, and the Inn's placid pace, that hammock on the beach may soon preempt all other distractions.